A common question we receive from our brides is, ‘will this wedding headpiece suit my face shape?’. And the answer is, send us a photo and an idea of your bridal hairstyle and we’d be happy to offer styling advice and recommendations! There’s a headpiece to suit every face shape, from the popular wedding crowns to the more traditional wedding combs, and there’s a very good chance we can modify our designs to suit you. When it comes to finding the perfect bridal headpieces and accessories, it’s all about accentuating your finer features, while drawing attention away from the areas you don’t want to focus on. Be sure to keep in mind that your wedding hairstyle will most likely be different to your everyday hair. There’s often a bit more volume and height to take into account which can change how a headpiece can frame your face and sit in your hair. Consider the tips below and find the perfect bridal headpiece that will flatter you from every angle. Most people fall into the following face shapes – oval, heart, round, long, square and triangle. Browse through our style icons to see what shape you are and the bridal headpieces that best suit you. If your jaw is slightly narrower than your temples, then you’re an oval. Think Jessica Biel, Kate Middleton or Kim Kardashian. Ovals are one of the most versatile face shapes of all which means you can literally pull off any look from the modern french knot to long loose waves. Finding a headpiece is relatively easy – most pieces and bridal hairstyles will suit your face shape. Why not make a statement with an opulant crown? Or perhaps you’re a modern romantic and a traditional bridal comb, will show off your look to perfection. We’re all a little jealous, because you can wear any and every wedding veil! A simple yet high impact piece, the Henri beaded bridal crown is designed for sophisticated brides and modern romantics. Features a gold colour palette, a scattering of ivory pearls and silver crystal details, all artfully arranged into an untamed silhouette – the Liberte is the epitome of organic bridal styling. Unashamedly feminine and ethereal, the Emmie chapel length veil with lace is for the classically chic and style-focused bride. A heart shaped face is one that is wider at the temples and hairline, with the focal point at your chin. Katie Holmes, Zendaya, Miranda Kerr and Reese Witherspoon are perfect examples of heart shaped faces. A bridal headpiece for a heart should draw attention to your eyes and cheekbones. Position the piece above your ear or along your hairline. If you have a fringe, position the piece near your temple to accentuate your cheekbones. Halos and traditional headbands are just made for hearts, while a veil secured at the back will avoid adding unnecessary volume at your temples. A luxurious and delicate statement piece that exudes the beauty of the botanicals in all its crowning glory. Designed for breezy silhouettes, structured lace gowns and contemporary gowns either with or without sleeves, this veil evokes effortless romance with feminine appeal. A round shape is full with a rounded chin and hair-line as seen with Emma Stone, Kirsten Dunst and Cameron Diaz. If you’re a round, your goal is to create less volume around the face by finding a bridal headpiece that will help make your face look longer. Avoid a piece with too much fullness at the sides – so a large flower behind your ear probably isn’t the best option. Instead, a wide headband or a rhinestone comb positioned to the side can soften the lines and will draw attention to your eyes. If you have a petite round face, choose a thinner headband or a crown. A mantilla-style veil with its soft, elegant lace perfectly framing the round face, will lengthen it while drawing attention towards your eyes. Inspired by the antiquity of yesteryear and the beauty of wild roses, this headpiece is bold, romantic with a touch of bohemian luxe. A versatile piece with flexibility with styling, the Titania creates majestic and stylish allure by combining silver and crystal details with a garden inspired design. This polished piece is captivating with its simple design and timeless beauty, gracefully flowing behind you as you walk down the aisle. If the length of your face is around twice the width, then you’re long or oblong. Sarah Jessica Parker and Gisele Bundchen are excellent examples. The perfect way to add width and draw attention to your gorgeous cheekbones is with a headpiece that can be worn amongst loose waves. If you love veils, find one that doesn’t add height to the top of your head but something that will add width around your face. We love birdcage-styled veils for longs because they add intrigue and mystery, while broadening your face. A veil draped simply over the entire face also work beautifully, as will a veil attached at the back. The Eden bridal headpiece winds along your hairline, uncurling dazzling, light-catching crystals at the perfect intervals to frame your face and highlight your tousled tresses. The Portia pearl hair comb is a subtle and feminine piece, drawing inspiration from times past for a touch of nostalgic glamour. Fastened with intricately beaded lace combs, the Leila can be adapted to romantic updos and loose curls to creates fuss-free, femme fatale glamour in an instant. A square face shape features a straight forehead and a straight line from the forehead to the jaw. Often this jaw is quite angular and is slightly wider than your temples and hairline. If you’re looking for square faces in the celebrity world, look no further than Kylie Jenner, Selena Gomez, Jennifer Aniston or Keira Knightley. When looking for an accessory or bridal hairstyle, your goal is to play down your angular jaw. Team up a headpiece with tousled curls and a striking side part. Choose a headpiece that you can wear near the temple to add length while creating a modern asymmetrical detail to soften the lines. Avoid anything near your ears or anything large directly up top. Wide headbands are a perfect way to create a round line and balance out your face. Squares, like longs, are made for birdcage veils. They draw attention to your temples while softening and rounding out your features overall. 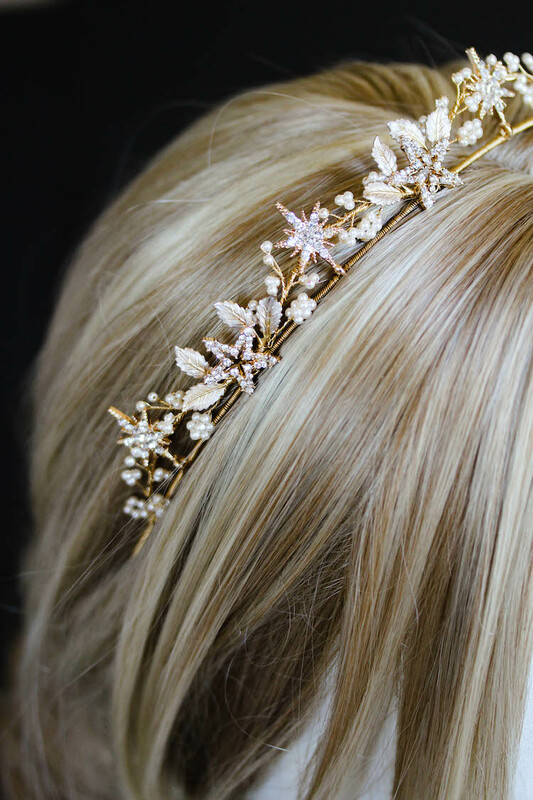 Golden vines entwine to create the Rosebury crystal wedding crown, a wild and whimsical bridal headpiece for a sophisticated and modern bride seeking a high impact finish to her wedding day look. Epitomising modern luxury, the Anais is handcrafted from individually set Swarovski crystals and delicate floral details in a soft shade of antique silver. For a look that’s high on feminine intrigue, the Parker bandeau birdcage veil offers an understated yet stylish vibe that flatters a wider range of bridal looks inspired by yesteryear. A triangle face is one with a dominant jaw line that narrows at the cheekbone and temples (aka Victoria Beckham and Kelly Osbourne). You’re also very unique. A triangle face shape is actually quite rare! You will need a headpiece that you can wear near the temple to draw attention away from your chin. Instead focus on your eyes and forehead. A veil, secured with a headband, will not only round out your features, it’ll add allure and grace to your overall look. Delicate branches entwine brilliantly in a way that’s equal parts boho-chic, delicate and dainty. Infused with handcrafted floral details, freshwater pearls and crystals reminiscent of cool shimmering waters, the Cassia embraces a mood of natural curiosities. This ethereal and feminine drop veil is all sorts of wonderful. Simple in design yet bursting with romantic appeal, the Blair fingertip length drop veil features a classic cut and clean raw edge. Don’t forget, if you aren’t sure, play it safe. Choose a wedding headpiece and wear it nestled into a bun at the back of your hair. Your guests will be admiring you as your walk down that aisle so don’t be afraid to add an extra point of interest from behind. 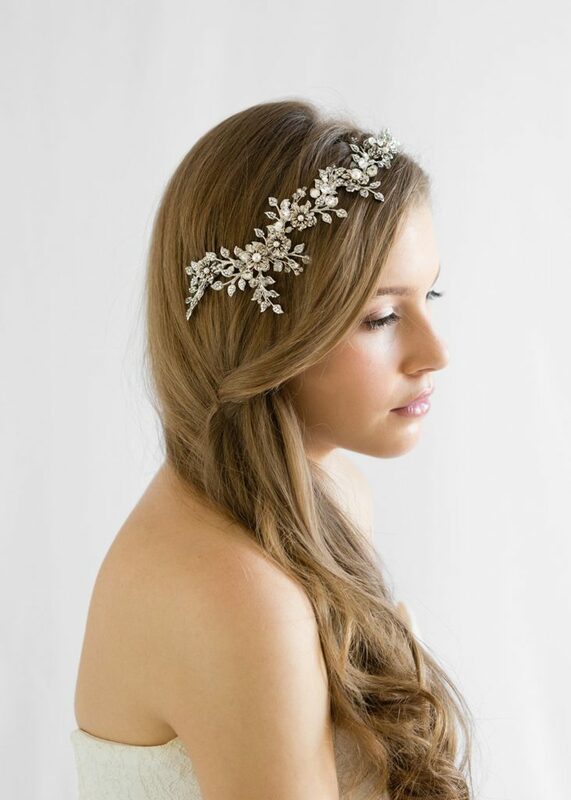 Love a certain bridal headpiece but not sure if it will work for you? Chat to our team, or have us design a custom made piece that flatters you and your dress from every angle.